A very bold statement, but well suited for one of England’s most famous and cherished cheeses. Blue Stilton is named for the town of Stilton where the cheese was first sold in the early 18th century at an inn, advantageously located en route between London and Northern England. News spread quickly about the exceptional new blue, making the inn a very popular destination in and of itself. Today, under Blue Stilton’s PDO status, Britain’s “King of Cheeses” can only be made by a licensed dairy in three counties: Derbyshire, Leicestershire and Notinghamshire, and solely with local milk. 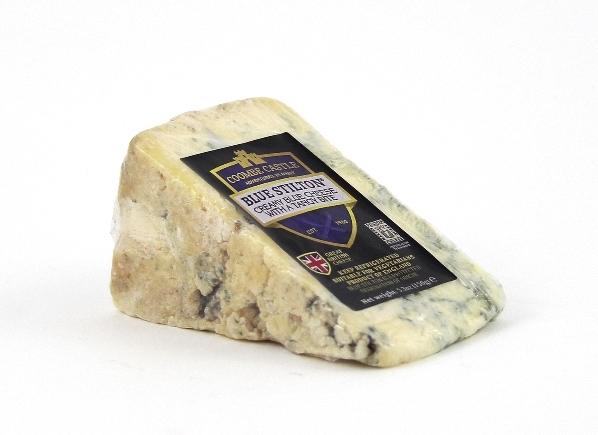 Prized for its smooth, honeyed, tangy richness and its striking blue veins that radiate from the cheese’s center to its rustic, natural, crinkly brown crust, England’s celebrated blue is most typically enjoyed at 10 – 12 weeks of aging. During the closely monitored maturation process each Blue Stilton wheel is individually and patiently turned and graded by hand. Coombe Castle’s rigorous selection process ensures their Stilton Wedges represent the epitome of Blue Stilton cheese-making traditions. Application: Blue Stilton is often a cheeseboard centerpiece, especially during the holidays, but is perfect any time of the year. Very versatile, Blue Stilton crumbles easily for salads, makes delicious dressings, adds great flavor to soups, risotto, pasta, potato and meat dishes or anything else that calls for culinary creativity. Blue Stilton is delightful served with pear, figs and walnuts. Pairing: The most popular pairing for Blue Stilton is Port, but since Blue Stilton goes with such a wide range of wines, it is usually a win/win with anything from a favorite dessert wine to the most robust red. Spain, one of the largest fig producers of the world, is especially renowned for their native Pajarero variety, which are smaller, have a finer skin, and an exquisitely sweeter taste when compared to their more common fig cousins. 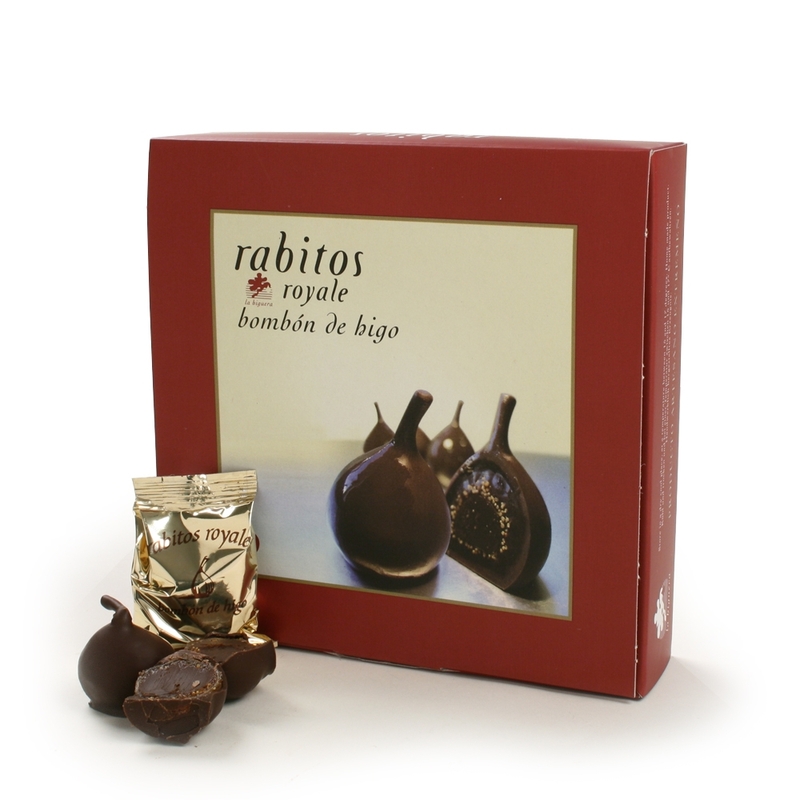 Rabitos is derived from the Spanish word rabito, meaning tail, as each dried, chocolate fig retains its stem. Only the finest, most tender young Pajarero figs are chosen to make Rabitos. Carefully dried, the figs are re-plumped with a divine filling of dark chocolate ganache mixed with the perfect amount of brandy. They are then hand-dipped in even more rich, dark chocolate and individually wrapped in foil to maintain a pristine texture and maximum freshness. The delicate sweetness of Spain’s Pajarero fig balances beautifully with the luxurious chocolate-brandy blend for an extraordinary delicacy. This chic gift box holds 9 Rabitos.